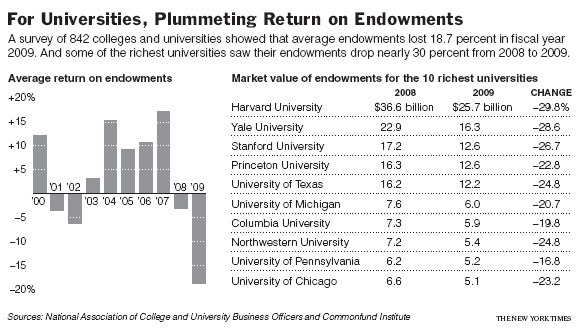 Reflecting the difficult financial environment for higher education, university endowments lost an average of 18.7 percent in the last fiscal year, the worst returns since the Great Depression, according to a study of hundreds of public and private institutions. 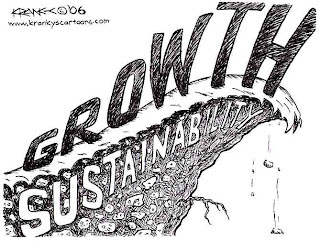 The study, by the National Association of College and University Business Officers and Commonfund, a nonprofit organization that manages university investments, also found that in the last year, many endowment managers increased the move from traditional fixed-income instruments and stocks into alternative investments like private equity, hedge funds, venture capital and private-equity real estate — all of which performed badly in fiscal 2009. This is a shocking mismanagement of funds. The endowment managers fell victim to age old blunders of chasing performance of previous years and shifting allocations into "falling knife" sectors of the economy. Hedge funds did very well in 2008 but underperformed somewhat in 2009. An average 18.7% decline is awful when the S&P 500 gained 28.8% for the year. And, funds only lost 3% in 2008, when the market lost 41%! "Institutions with endowments greater than a billion dollars had 61 percent of their investments in such alternatives last year"--perhaps trying to be too creative? It is quite amazing the blunders were so widespread and the "smartest" of the funds did the worst.